Missouri lawmakers have moved the voting date of a ballot measure supported unions from November to the August primary. The resolution, which passed in the Senate at roughly 5 a.m. last Friday after a nearly 12-hour filibuster, cleared the House Thursday morning. The current legislative session ends this Friday at 6 p.m. The Republican-dominated legislature started moving aggressively to get the resolution across the finish line after an effort to get a right to work ballot measure before voters failed to rally enough support. By moving the union-backed ballot measure to August, Republicans contend they’re trying to get the issue settled earlier to give businesses certainty moving forward. But they may also be looking at conditions they perceive as favorable: Primaries in August historically have had lower turnout and there’s research showing Republican voters tend to be more conservative in such elections. Republicans appear to be fast-tracking another proposal to thwart union efforts. A bill endorsing right to work as a Constitutional amendment was ignored until the pro-right to work ballot measure collapsed. The day after it failed to meet a deadline for signatures, the Constitutional amendment proposal was rushed through committees and approved on the House floor last Thursday. It’s now awaiting action in the Senate as the session winds down. If it clears the legislature, Republicans would have two ballot measures as Constitutional amendments also require a public vote. A right to work law has been in a holding pattern since last year when unions were successful in getting their ballot measure finalized before the statute was scheduled to take effect August 28. During the 2017 session, Republicans passed a right to work bill which GOP Governor Eric Greitens swiftly signed into law. 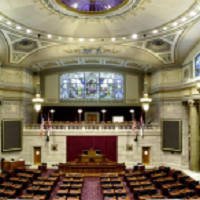 Previous right to work legislation had been vetoed by Democratic Governor Jay Nixon.